Mount Carmel rises from the Mediterranean Sea to about 500 meters above sea level, wth the city of Haifa built on its western slope. The mountain is rich in biological, geological and geomorphologic diversity with contrasting landscapes, a mixture of agricultural areas and prehistoric and archaeological sites. In the area we were in there was a Roman quarry and part of an olive press. Mount Carmel is covered mainly with a natural forest of Mediterranean oak shrubland (Quercus calliprinos) and mixed pine (Pinus halepensis). In 1996 UNESCO desgnated Mount Carmel a bio-sphere reserve in recognition of its specialness. 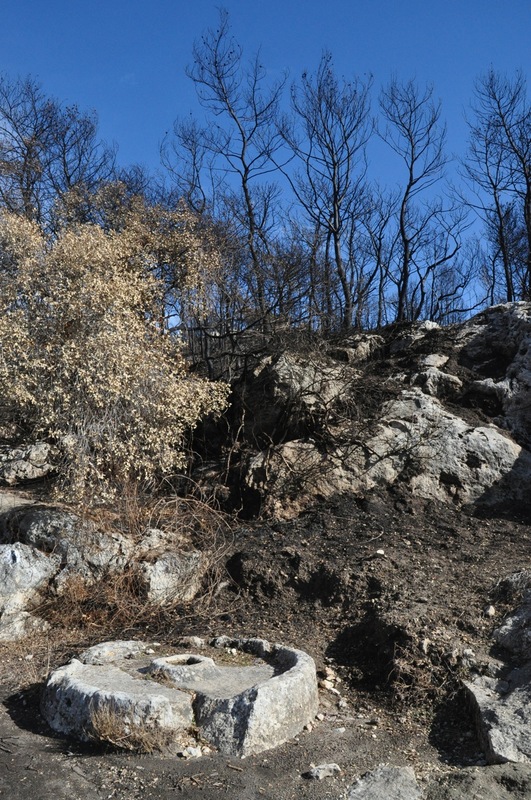 On December 2, 2010 a fire erupted on Mount Carmel burning for 4 days until fire fighters could get the blaze under control and destroyed over 50,000 dunam of forest. 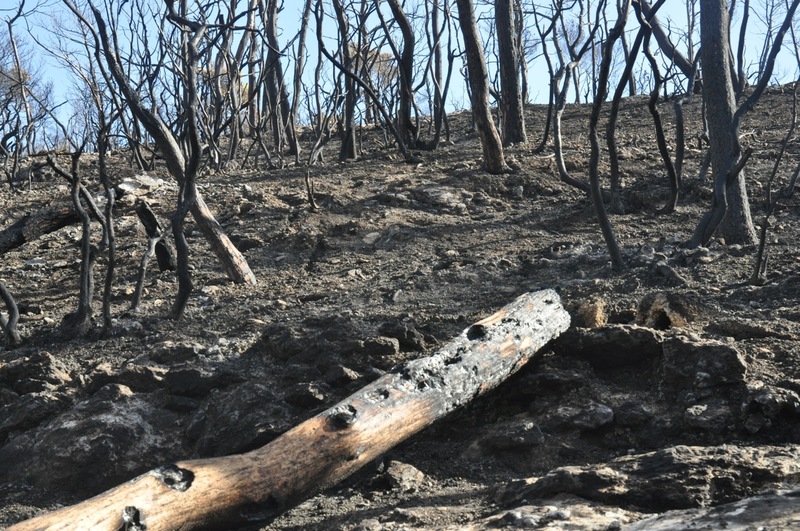 The JNF estimates that 1.5 million trees were burnt in the fire, some estimates raise the total figure to 5.5 million trees and the Carmel Hai-Bar nature reserve was damaged. We learned that pine trees, soft woods with a lot of resin, are usually killed by the intense heat; their survival mechanism is that the pine cones open in the heat and hundreds of seeds are scattered. The oak trees, being a hardwood, often are able to live, the branches are burned and die but the roots survive and send up new shoots. According to officials, nearly half of the 150,000 dunams of the Carmel Forest reserve have been destroyed in the fire and it will take at least 20 years for the forests to grow back. On Friday I went up to the Carmel on a tour organized by Israel’s Green party, where experts from the Technion and Ben Gurion universities taught us about the forest ecology. 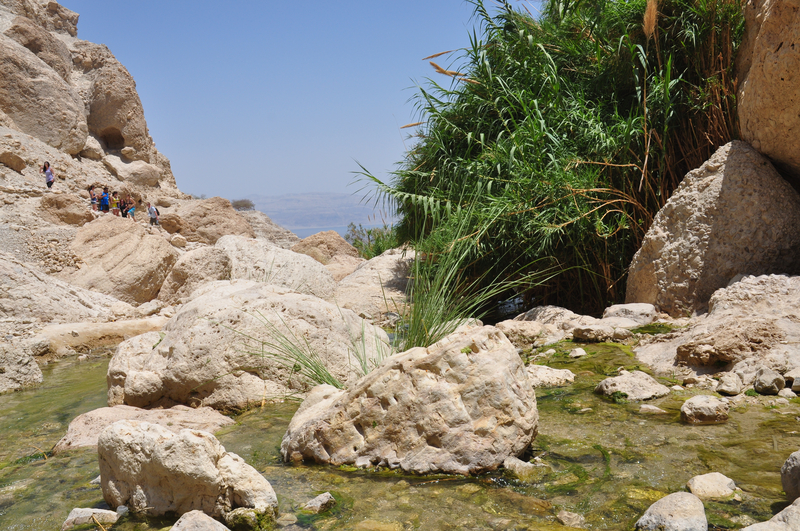 There were a lot of differences of opinion among the experts – some experts said that authorities had been warned about the situation, Israel had a very long, hot summer and almost no rain this winter and a drought for the last 3 years, that there were not enough resources put to addressing the problem. Other experts said that fires are natures way of clearing old forests and that a fire every 20 years is a good thing, that with the very dense underbrush, once the fire broke out, it was impossible to contain, no matter what resources would have been applied. Unfortunately, it seems clear that climate change and human intervention is accelerating the number and size of fires. 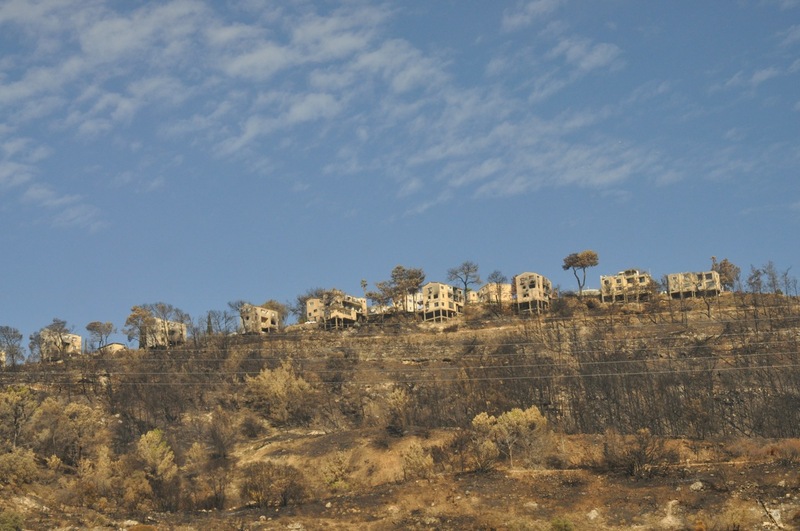 The fire damaged 74 buildings in Kibbutz Beit Oren, Ein Hod, Nir Etzion and Yemin Orde and forced the evacuation of more than 17,000 people. Tragically, at least 44 people lost their lives – a falling tree trapped a bus carrying police and prison services personnel on their way to evacuating the Damun prison in a fireball. Beit Oren and the youth village of Yemin Orde where our daughter Tiferet had volunteered in 2002 sustained damage, the library was badly damaged and the young people, mostly Ethiopian and Russian students, lost most of their possession and homes when they were forced to evacuate. 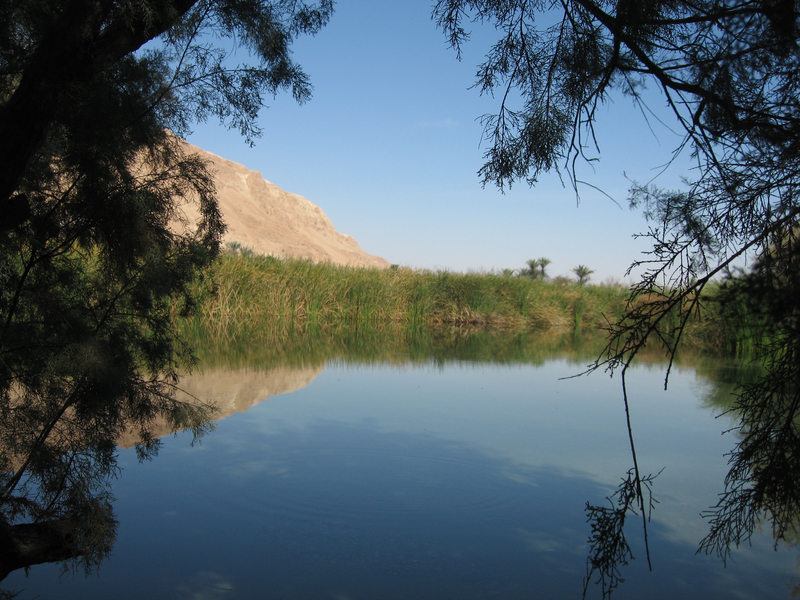 For more information about Yemin Orde and the work they are doing check their website at http://www.yeminorde.org. 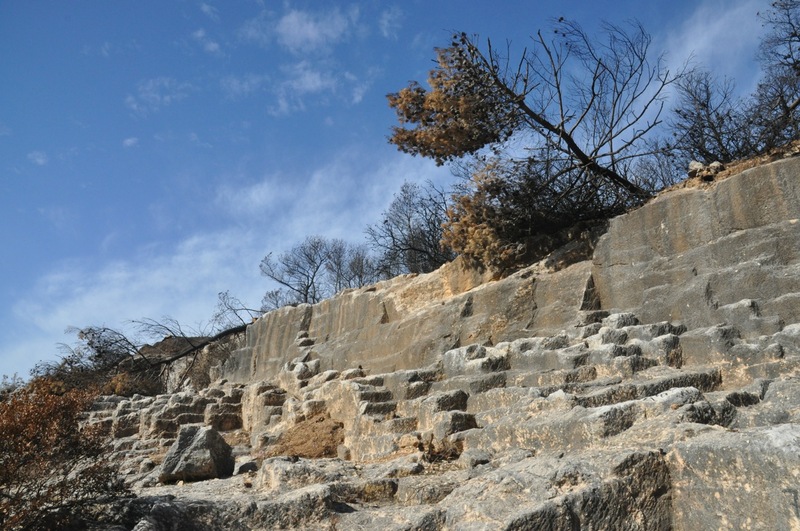 This entry was posted in Archaeology, Nature and tagged archaeology site, bio-sphere, biodiversity, Carmel forest, ecology, Jewish National Fund, nature reserve, prehistoric site, Yemin Orde youth village on December 20, 2010 by Shmuel Browns.